All transactions are safe and secure with a reliable history in online purchasing behind each of our associates. Buy the Flight Suit Maverick Top Gun Costume to own Top Gun clothing and merchandise. The appearance of the meticulously recreated Top Gun Maverick costume on the left will send your adrenaline toward the danger zone. This cool Top Gun Flight Suit was designed based on notes and screenshots taken from the Tom Cruise Top Gun movie. The silk-screened faux logos and patches (glued on to give the appearance of a patch) are based on the patches on Maverick's flight suit in the movie. Impress your friends at costume parties or wear it when you go trick-or-treating with your kids. Wear it overtop of your favorite Top Gun logo tee. 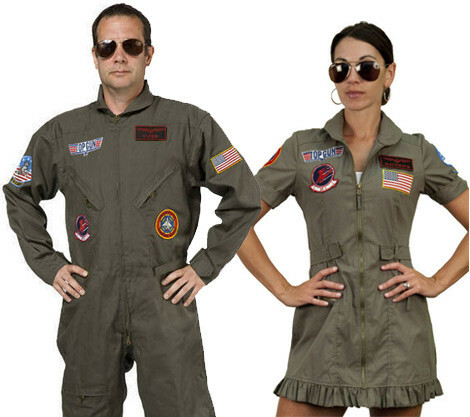 In addition to the Flight Suit Maverick Top Gun Costume above, browse the Top Gun Clothing Gallery for more apparel like men's and women's clothes, kids shirts or hoodies.